When you think about swimming in the ocean, what’s the first thing that comes to mind? I’m guessing sharks. When it comes to SEO and content marketing, there’s another Jaws effect playing out in our professional lives. It stars a different shark, namely Google. This shark’s evolving search algorithms lurk beneath the warm waters of the web, devouring websites and content programs that can’t keep up with algorithmic shifts. Many content marketers are already well-aware of the importance of search visibility. In Content Marketing Institute’s 2019 research, a full 63% of B2C organizations cited changes to SEO and search algorithms of top importance. So when it comes to SEO, how can you keep up? Well, you likely already know backlinks are important. And you know creating targeted content is essential. What about performing some keyword research and picking relevant topics? Duh, no brainer. What you likely haven’t considered is the importance of parent and child keywords, or as I call them great white and school fish keywords. If you’re willing to dive in with me, we’ll sink our teeth into great white keywords and I’ll show you how they can improve your SEO-related content marketing efforts. If you try some of the following keyword research ideas, you just might not get eaten alive by search engines. Three major factors influence organic search engine rankings: links from other websites, keywords, and content. Since 2012, Google has re-tooled their algorithm and released dozens of updates that change how websites get traffic from search engines. Just a few years ago, marketers were encouraged to use “exact match keywords” (keywords that precisely match the search term used in Google) in meta data, links, headlines and website body copy to gain organic visibility. More importantly, they needed lots of other websites linking back to their own using that same exact match keyword in the anchor text (link). Today, it’s not that simple. Because of algorithmic changes and the introduction of machine learning, the relationship between keywords has become far more complex. Likewise, the competitiveness has shot up like a shark ambush on an unsuspecting seal. The biggest shift being search engines can now evaluate dozens, sometimes hundreds of keywords and the context of those keywords in relationship to each other. Groups of contextual keywords now funnel into related buckets, and the website or piece of content Google deems most relevant for the keyword grouping usually wins most of that traffic. But in keyword groupings, you’ll typically see a handful of great white (parent) keywords, and then dozens – sometimes even hundreds – of school fish (child) keywords. The correlation between these great white keywords and school fish keywords has grown ever more important, especially in the past two years. If you develop a strategy for getting your content to rank on the great white keyword, the school fish keyword traffic will follow. Likewise, if you try to rank for a school fish keyword without building a strategy for catching the great white keyword, you may never gain optimal ranking for either keyword. If you take nothing else away from this post, please heed this concept. Great white keywords are higher traffic, shorter and typically more competitive keywords. Let’s say, for example, your company sells tax software. Your great white keywords might be “tax software”, “tax tools”, or even “software for taxes.” Getting organic traffic from these great white keywords is hard. Really hard. School fish keywords are usually lower traffic, longer, and less competitive. These might include, “best tax software for students”, “affordable tax software”, “easiest tax tool 2019,” “how to use software to do your taxes.” Content marketers that win on great white keywords will usually also win on dozens of school fish keywords, sometimes without using those exact words. Ok, you get it, but how the heck do you find the right great white and school fish keywords to use in your content marketing efforts? Here’s how you can get started. 1. Start by mapping your core business functions and benefits to customers. You’ll notice that search engines will offer many clues about related queries, and the great white keyword you should target. You can do this in a word doc, spreadsheet, or use one of the many tools available. 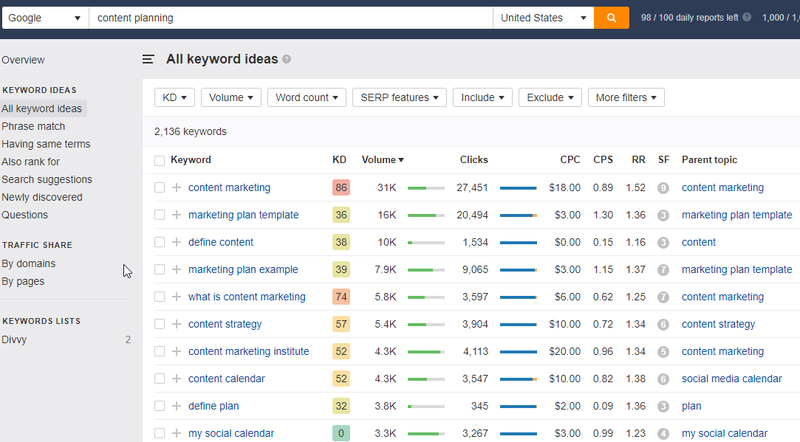 Consider trying ahrefs, SEMrush, or Google Keyword Planner. If you don’t use a keyword research tool, you’ll need to decipher for yourself which keywords are great whites and which ones are school fish. As you explore suggested keywords around your core business function, take note of common denominators. 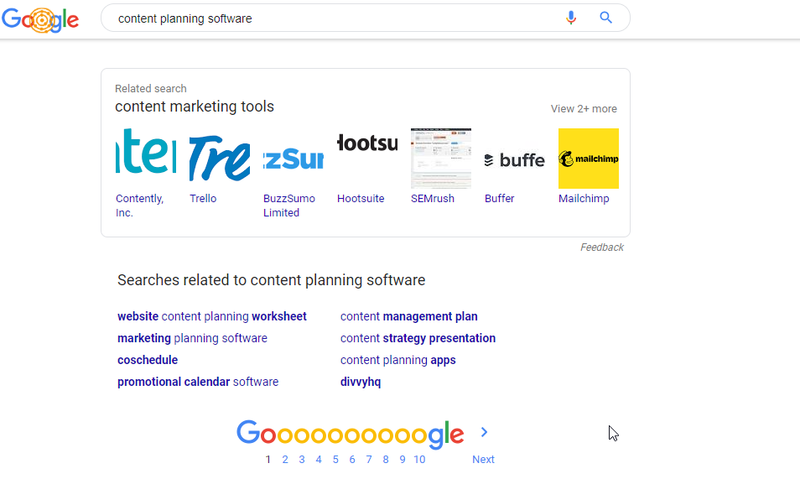 For example, many of the related keywords in our example search included the term planning, or were related to the planning aspects of content. Planning queries related to topics including social media, content marketing, advertising, writing, editorial planning and more all link back to our core business function; content planning software. Surprise! DivvyHQ also shows up in related queries. And not by accident, mind you. In our example, content planning is the great white. But we can’t stop there. Now we must decide which page, blog post, or piece of content we want ranking for that term. In the SEO world, this is commonly called a power page. Once identified, you’re ready to start improving your rankings for that existing page. Here’s where SEO-informed content planning comes into the mix. 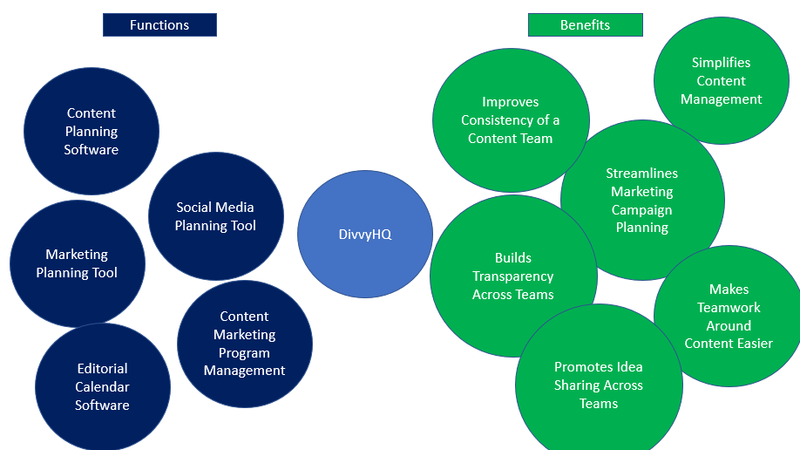 What is content planning? So happy you asked. Within each of these topical areas, we’ll find school fish keywords that can pass authority and traffic up to our great white content planning page. Brody leads the DivvyHQ team with more than 15 years of experience in the trenches of corporate marketing, advertising agencies, entrepreneurship and establishing himself as one of country's top digital marketing strategists. Brody's primary focus is helping companies and marketing agencies shift their mindset, structures and processes so that they will think, act and consistently deliver like publishers.